the new party pattern is out! La vie est belle (Dieppe) was designed for the fifth (!!!) meeting-the-gang weekend that will take place april 28/29th in Dieppe/France. 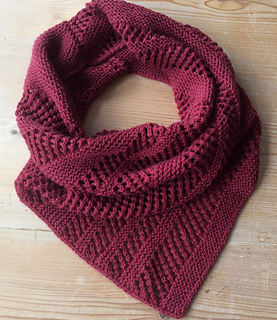 Again, the goal was to keep the knitting easy enough to be able to giggle and babble and have a glass of red wine (or two…). 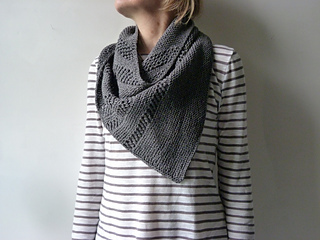 It is a fun accessory that combines the shape of a triangular shawl with a casual cowl. It is worked back and forth on the bias, from the right edge towards the left edge in 3 steps. 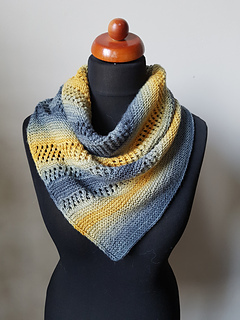 Easy lace pattern bands add interest and make knitting this a fun experience. 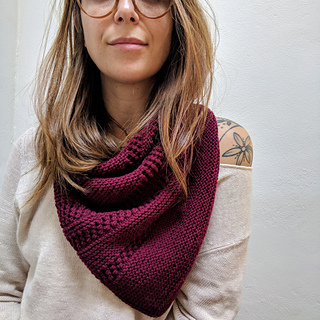 The combination of lace and squishy garter stitch gives this cowl/shawlette a sophisticated yet casual look. US 6 (4 mm) circular needle, 40” (100 cm) long or size needed to get gauge. 20 sts x 40 rows = 4 x 4” (10 x 10 cm) in garter stitch after blocking. 26” (66 cm) wide, 9.5” (24 cm) high at the sides.